September is the month of the Harvest Moon. 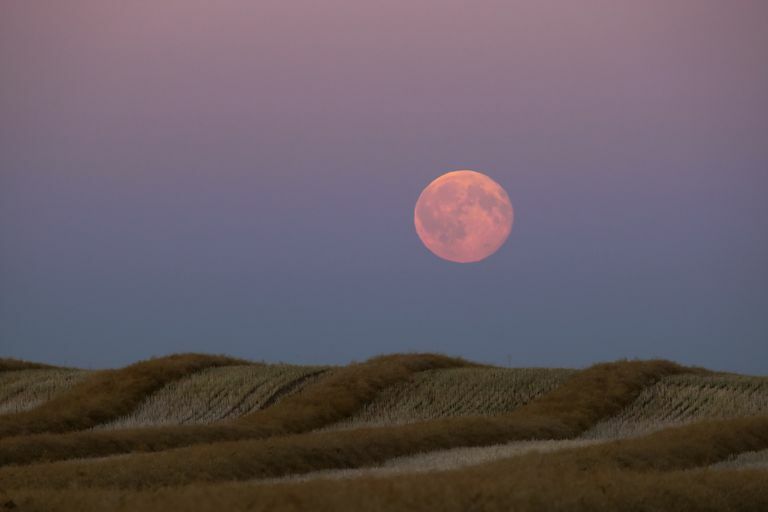 September brings us the Harvest Moon, sometimes referred to as the Wine Moon or the Singing Moon. This is the time of year when the last of the crops are being gathered from the fields and stored for the winter. There's a chill in the air, and the earth is slowly beginning its move towards dormancy as the sun pulls away from us. It's the season when we're celebrating Mabon, the autumn equinox. Colors: Use browns and greens, earth tones, to represent the changing colors of the fields and lands around you. Gemstones: Citrine, chrysolite, peridot, bloodstone, and other reds, oranges, and yellows can symbolize the colorful leaves on the trees in your area. Trees: Bay, larch, hawthorn, and oak are all associated with this time of year. Gods: Demeter, Brighid, Freyja, and Vesta, as well as other deities of the harvest, are appropriate to honor in September. You can also work with gods connected to vegetation and vines. Herbs: Do magic involving wheat, valerian, witch hazel, and skullcap, along with other sacred plants of the season. Element: Earth is typically associated with this time of year. This is a month of hearth and home. Spend some time preparing your environment for the upcoming chilly months. If you don't already have one, set up a hearth or kitchen altar for those times when you're cooking, baking and canning. Use this time to clear out clutter—both physical and emotional—before you have to spend the long winter days inside. "The usual behavior of the Moon is to rise distinctly later each night —an average of about 50 minutes later... But around the date of the Harvest Moon, the Moon rises at almost the same time for a number of nights in our intermediate northern latitudes." Why does this happen? Because "the Moon's orbit on successive nights is more nearly parallel to the horizon at that time, its relationship to the eastern horizon does not change appreciably, and the Earth does not have to turn as far to bring up the Moon. Thus, for several nights near the full Harvest Moon, the Moon may rise as little as 23 minutes later on successive nights (at about 42 degrees north latitude), and there is an abundance of bright moonlight early in the evening, a traditional aid to harvest crews." In China, the harvest moon holds a special significance. This is the season of the Moon Festival, which is held every year on the fifteenth day of the eighth lunar month. In Chinese mythology, Chang'e was married to a tyrannical king, who starved his people starved and treated them brutally. The king was very afraid of death, so a healer gave him a potion that would allow him to live forever. Chang'e knew that for her husband to live forever would be a terrible thing, so one night while he slept, Chang'e stole the potion. The king figured out what she had done and ordered her to return it, but she immediately drank the elixir and flew up into the sky as the moon, where she remains to this day. In some Chinese stories, this is the perfect example of someone making a sacrifice to save others. The Chinese Moon Festival is considered a family event, and entire extended families will sit up to watch the moon rise together on this night, and eat Moon Cakes in celebration. HuffPo's Zester Daley has some great ideas on making your own moon cakes. Finally, remember that the harvest moon is a season about reaping what you have sown. Remember those seeds you planted in the spring—not just the physical seeds, but the spiritual and emotional ones? This is the season where they are bearing fruit; take advantage of all of your hard work, and collect the bounty you deserve. Here are a few ways to benefit from this month's full moon energy. Jessica at MoonKissed has a great suggestion for increasing your personal harvest, and says, "Increasing harvest is a two part process: first we give gratitude for the harvest we’ve already received, the abundant friends, lovers, passions, and support from the Universe. Then Ask for our cup to be full or re-filled, in balance. Anything you’d like to increase, desire more of, would like illumination about, put into this spell." Use the harvest season to plan ahead for the coming winter months - stockpile magical supplies and ingredients so that you'll have them on hand when it's too cold or snowy to get them fresh. Consider the abundance you have in your own life, and start thinking about ways you can share it with others. Can you donate things to organizations that help the needy? What about setting up a food drive, or volunteering your time at a homeless shelter? Use this time of year to pay things forward, both materially and magically.